I was so happy when I received another Team Mom package for review. Although this time I had to pass the samples along to one of my mommy friends since it was baby feeding products.I don’t mind sharing. 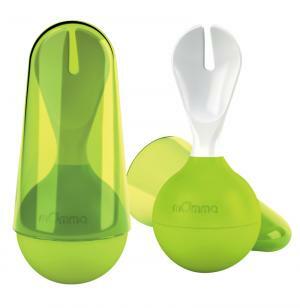 When I opened the box of mOmma products I thought “how cool.” The sippy cups looked like weeble wobbles which is funny because my mommy friend said the same thing to me…I guess that kind of dates us eh? My mommy friend has a 9 month old little boy who was perfect to try these products out on. My mommy friend loved all the products. Her favourite feature was that they land right side up so that when you are out and about you don’t have to worry about your little one dropping them and landing on a dirty floor. She loved the bright colours as well (they were orange and green). They have dual handles so its easy for little hands to grip onto. She thought the warming plate was genius since it can take your little one awhile to eat a meal and it saves you from reheating all the time. The only complaint that she had is she wished the handle on the spoon/fork was longer. 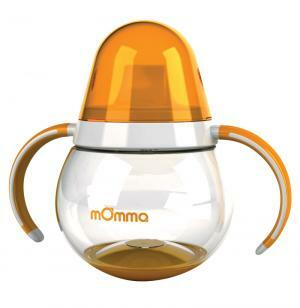 mOmma products are BPA and phthalate-free and dishwasher safe. mOmma also offers bath products, potty products, floor mats and rugs and pet products. Products are available at www.mOmmaUS.com www.amazon.com and www.diapers.com You can also find mOmma on Facebook. The company is running a photo contest on its website (www.mommaUS.com) where readers can enter to win product. They think of the coolest things! Neat-o. wow that has to be the coolest sippy cup I’ve ever seen. I stopped by from the this for that linky but I’m already following you.